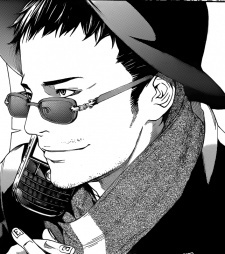 Rinta has short-cropped, dark hair with stubble on his chin. He wears a scarf and a hat, along with a dark jacket over a plain T-shirt, light colored slacks and sandals. He has letters imprinted onto his fingernails. With Left Hand showing the letters L I V E D, from the pinky to thumb. Either stating Devil or Lived. The right hand, however, only has the letters D E A R shown, running from his thumb to his ring finger, with a creature, with bat-like wings on his pinky.